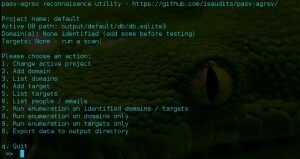 Browse: Home / pasv-agrsv Update – Passive recon / OSINT automation script. + modules, config and pasv-agrsv.py; add screenshot delay option. 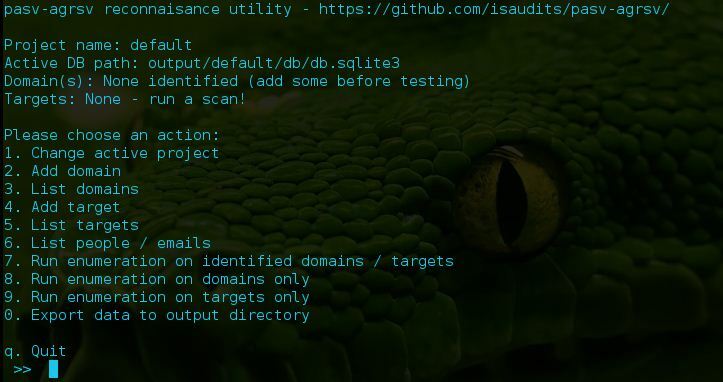 By default, the application runs in interactive mode allowing the user to select a project name / output directory as well as add multiple TLDs for analysis before executing scripted tasks. Optionally, a single domain can be specified as a command line parameter to immediately create a new project and execute the scripted tasks against that domain upon launch. All scan parameters are pulled from config files so multiple configurations can be developed and specified with the -c flag. An example config file (default.example) is included and will be copied into the default path (default.cfg) upon initial launch.